Along the streets of Bukit Timah, Choupinette is easily missed despite its rainbow-coloured signboard, located right beside Coronation Plaza. I've often dismissed it as a shop selling wine, only to realise upon reaching that this is the one! 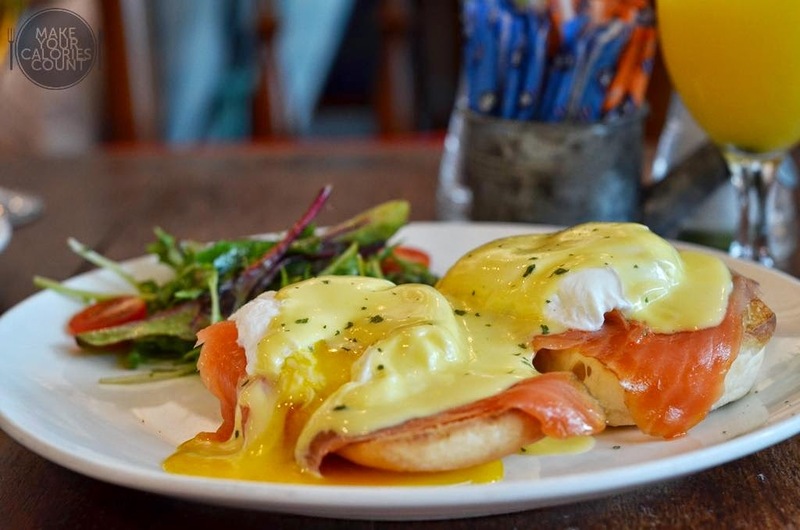 Serving up rather decent brunches, it is a very cosy setting allowing for just about 20 persons seating at one go. With a bakery stand, desserts counter and bistro-styled dining, it's really the place to go just to chill out with your girlfriends any time of the day! Stepping into the place just makes you feel like you're in a time-warped machine, where you can just while your time away here, and the world seems to slow down altogether. The whole ambience makes you want to savour your food slowly and just chill over a cuppa coffee. Downside, though, would be the slightly cramped space that you have to move around sometimes in order to allow people to pass. For every brunch set, it comes with a cold drink, a hot one and the main course itself. I think it's absolutely awesome that they provide the variety and the impression that you can take your time for your meals. Classic English breakfast, with sausage, poached eggs, mushrooms, tomato and baguette. Cutting open the poached eggs, its yolks oozed out immediately and it was to a perfect warm temperature. The sausage was a little disappointing, as I'd expected a thicker pork sausage. It was a tad too salty, even by the standards of plain sausages. The baguette was truly awesome though! It was just crisp on the outside and toasted to the right level even for the insides! I believe that everytime you eat a great baguette, it should be a messy affair, and this truly lived up to it. Even the parts right inside were very lightly toasted, without charring or over-toasting the outside. It was definitely impressive! A simple dish done well in my opinion. I like the creaminess of the Hollandaise sauce generously drizzled over the poached eggs and the eggs' standards were maintained for all our dishes. It was a good combination of ham with sourdough bread which gave the different textures coupled with the egg. Fit for the royalty! Just when I thought the Eggs Ben were done well, this truly exceeded my expectations! I've always thought that smoked salmon wouldn't be a good complement to the dish because it will be slightly cold and slimey, not giving the extra crunch to the experience. However, this one proved me wrong by having very slightly toasted smoked salmon, adding to the flavour of the dish and just a little crisp to it. Highly recommended to try this at Choupinette! Overall, I've enjoyed my brunch experience, with dishes that exceeded my expectations (probably I'd lowered them after visiting Hatched). The ambience is definitely great, for families over breakfast, girls' sessions over tea, and I can imagine the place coming to life at night just like the places along Bukit Timah. A nice, cosy setting for you to just stop and smell the breads :p I would recommend this place for just a decent brunch!